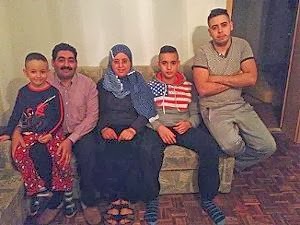 Islam versus Europe: Germany - "Spanish Family" Granted Welfare Benefits. Germany - "Spanish Family" Granted Welfare Benefits. The Sozialgericht (social affairs court) of Dortmund has this week granted via urgent procedure welfare payments to an immigrant family. The Spanish couple, who have been living with their four children in Iserlohn – Sauerland since last July, will immediately and retroactively get 1033 Euros welfare payment per month. Up till now they had been living for half a year from children's money allowances and mini-jobs. The Märkischer Kreis jobcenter had previously rejected their application for Hartz IV (welfare allowance). The ground for this was that EU foreigners staying in Germany solely for the purpose of finding a job have, according to German law, no right to apply for these benefits. But now the social affairs court in Dortmund has initially overruled the exclusion from social benefits on grounds of “considerable doubts”. The fundamental right of freedom of movement forbids that EU citizens be discriminated against when it comes to social services intended to tackle unemployment. The family had also hoped for this decision when they decided to go to Germany: "I saw a report on TV that people live better in Germany than in Spain, and it was also said that in the EU, all people are equally treated and supported," the head of the family, Said El Kadi D., recalled when talking to FOCUS Online. “This was a surprise for me. I just know that in Spain one has to have worked in order to get social benefits”, the head of the family said. Up till now these Spaniards had been living from children's money allowances, the father’s part-time job as pizza deliverer and the 21-year-old daughter’s 400 Euro job in a restaurant. But this was nowhere near enough. “The family had been living from hand to mouth and going to free-meal dispensaries and charities”, lawyer Lars Schulte-Bräucker explained when talking about the situation in which the family had been living since last November. He was also the one who forced the situation to be brought to the social affairs court via urgent procedure in just 3 months by appealing to “legal procedure in emergency case”. “such procedures take usually 1.5 to 2 years”, he said. Said El Kadi D. had been working in the bakery industry for over 20 years before losing his job. “After that, I found no other employment. But after watching the TV report, I got convinced that things are better in Germany”, he explained when talking about the reasons for him having left the country. They may be from Spain but they are nothing but freeloading muslims. Would you call them now Germans instead afterwards? Because they are living in German right now. They are not Spanish in the same way that they aren't neither Slavs nor North Americans (e.g. Texans), but we have the historical drama of "sharing" borders. I fully agree with the previous comment, they are simple free-loading muslims, but blame on our politicians and their voters. This is the decline of Europe anyway. The judges should be sacked. If they can't be sacked they should be moved sideways and parked somewhere where they can do no harm. The law is useless anyway- its sole purpose is to destroy the white race. Democracy only works when we are all of the same race and like minded. Democracy cannot work now that our countries are being overrun by people who are not like us. Good God. How much longer will we tolerate this?